First off, take time to breath. You pride and joys are probably fine. They may be somewhat traumatized by the whole experience, but that would be any pet caught in unusual situation. Unless extreme damage was done, their health probably is not an issue, however their home may be in need of some repairs. You may have been completely prepared for the storm, or the storm may have taken you by complete surprise. Whatever the case may be, you must jump into action as soon as you physically can to ensure that no further damage is done to your pond. If you netted your pond, clear as much debris off the net as possible and remove the netting. Once you removed the netting you will be able to survey the damage and the condition that your fish are in. If high waters were expected and your sand bagged the area around you pond, as long as the water level is normal, remove all sand bags so that you can easily access your pond. Do not get discouraged if things seem out of place, and it may not be as bad as it originally looks. Once you have removed all netting and other precautions, take time to look at the area. If any debris is present, remove it by skimming and netting. If plants or decorations are uprooted or out of place, replace them to their rightful area. If you find major damage to your pond, it is important to remove your Koi as soon as possible. Proper bagging and transporting techniques may be needed if the damage done will take a large amount of time to fix, but there are several temporary options available if damage can be fixed quickly. You may want to consider using a children’s pool to house your Koi. If nothing is available at the time, get into contact with your local pet store or zoo, as they may have program available to help you house your Koi until maintenance can be done. Once you have decided that only small repairs are needed, then you must focus on the water quality. You water may seem cloudy or murky due to the storm and the amount of extra water from rainfall. If the storm lasted for a long amount of time, you may be facing ammonia issues as well. Test your water for Nitrates. If Nitrates are present, add the proper amount of salt to the water. Typically you would add 3/4 to one pound of salt per 100 gallons of water. However, if your fish are especially shocked by the situation, or seem to have sustained any type of injuries, it may be a good idea to add more. 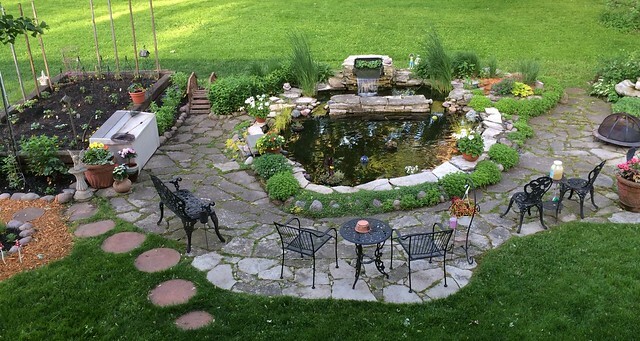 If you have plants in your pond, it may be a good idea to remove them before adding the salt into the water. Your fish should be the most important issue at this point, not your plants. If you are having KH issues (especially if it is below 100) you will want to add baking soda to your pond. Typically you can add 1 cup of unpacked baking soda per 1000 gallons of water. This will protect your pond from a future pH crash.